The Dual Purge System delivers a variable nitrogen purge into the glove box. During normal operation, it provides a continuous low-flow purge to maintain a positive pressure that blocks out contaminants. 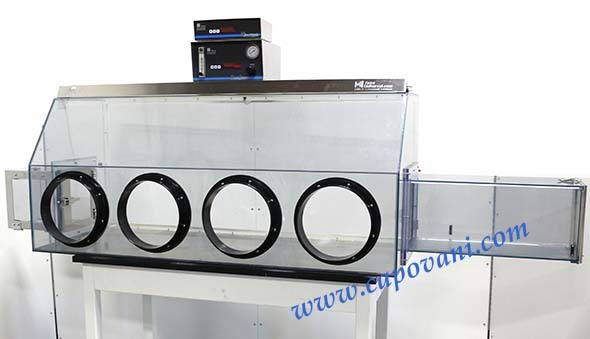 In the event of a sudden pressure drop, it activates a high-flow purge to block out contaminants and to quickly purge any moisture or contaminants that do enter the chamber. The NitroWatch provides automatic low-humidity control. It monitors the internal relative humidity and activates the high-flow purge when the moisture climbs above an adjustable set point. The Automatic RB(Relief/Bleed) Valve provides safe pressure relief with these control systems and also functions as a check valve, ensuring that no moisture or contaminants enter the chamber in the event of a negative pressure. All glove boxes feature a tapped 0.125" NPT inlet and a 0.25" NPT outlet for connection to these controls. Airlock Right Side: 10" x 10" x 10"
Overall Length including airlocks: 96"